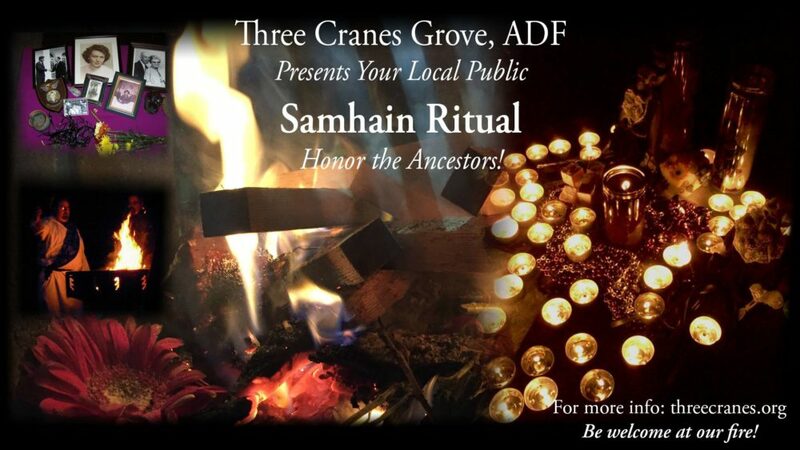 Three Cranes Grove, ADF, would like to invite you to the feast of Samhain on Sunday, October 28th! We will be at the Cedar Ridge Lodge at Battelle-Darby Metro Park. This free, public ritual will honor our Beloved Dead, those ancestors that we’re particularly close to, often those we knew or life or in living memory.. In addition to our usual ritual preparations, we invite attendees to bring pictures or other mementos of their own Beloved Dead; we will create a temporary community shrine that will be available for contemplation before and after the ritual. We will have candles available for lighting, and the resulting bank of lit candles will become our ritual fire. Please consider bringing a dish to share for the potluck (though if you’re unable to do so, you’re still very welcome to enjoy our fellowship and friendship after the rite). Not sure what to bring? Anything will be welcome, but hearty main dishes are always especially helpful. Many people have dietary restrictions, so if you’d like to be especially hospitable, it’s great to have a label, especially if a dish may be appealing to a particular population (vegetarian, gluten-free, etc.). Please bring a canned good for local donation. For ideas about what to donate, please see the Mid-Ohio Foodbank’s needed donations list. Coming to our rite for the first time? We’d love to help you know what to expect. Battelle Darby Creek Metro Park is at 1775 Darby Creek Dr, Galloway, OH 43119, USA. Battelle-Darby Creek Metropark is on the west side of Columbus. From I-270, exit onto US 40 (Broad Street) and go west. After about 5.5 miles, turn left (south) onto Darby Creek Dr. After 3 miles, turn right into Battelle-Darby Creek Metropark. Take the first right into the Cedar Ridge Lodge area. The Lodge and handicapped parking is down the hill a bit, but a large parking lot can be found by bearing to the right.